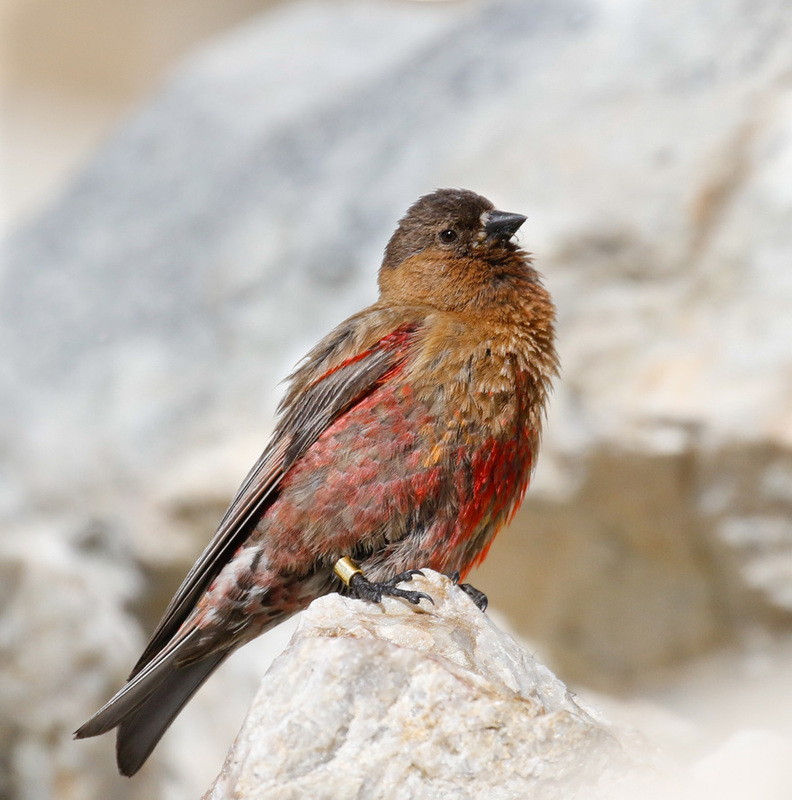 A colorbanded Brown-capped Rosy-Finch. Photo by Joel Such. 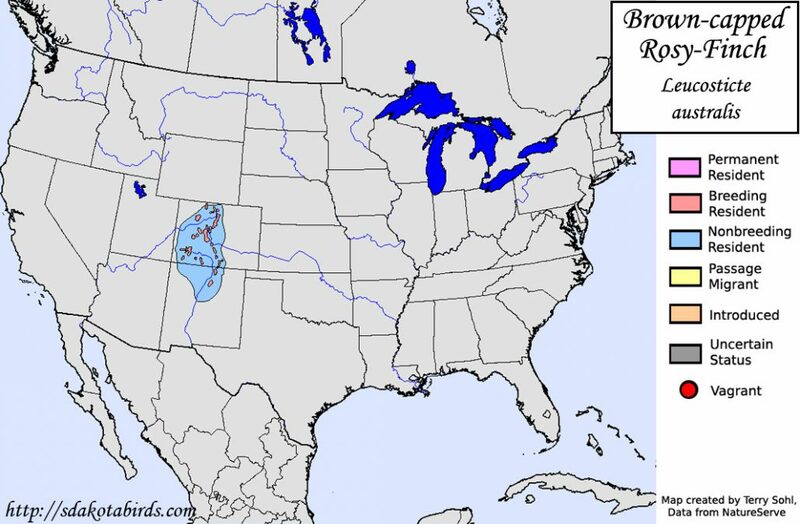 Brown-capped Rosy-Finches (Leucosticte australis) nest at higher elevations than any other bird species in the United States, and their breeding distribution is almost entirely limited to Colorado. They spend most of the year well above tree line, feeding on seeds and insects on snow fields and in short tundra vegetation, moving to lower elevations for short periods during winter storms. Despite residing in an almost pristine environment for most of the year, Brown-capped Rosy Finches (BCRF) have declined by as much as 95 percent over the past 50 years and, unfortunately, we don’t know why. In order to obtain a better understanding of the movement patterns and intermixing of breeding populations, Bird Conservancy of the Rockies is collaborating with the Denver Museum of Nature and Science (DMNS), University of California at Santa Cruz, Colorado Parks and Wildlife, the U.S. Fish and Wildlife Service, and the U.S. Forest Service to colorband BCRFs on their wintering and breeding grounds. Our objective is to collect data about (and genetic material from) these birds that will help us understand the reasons for their rapid population decline. 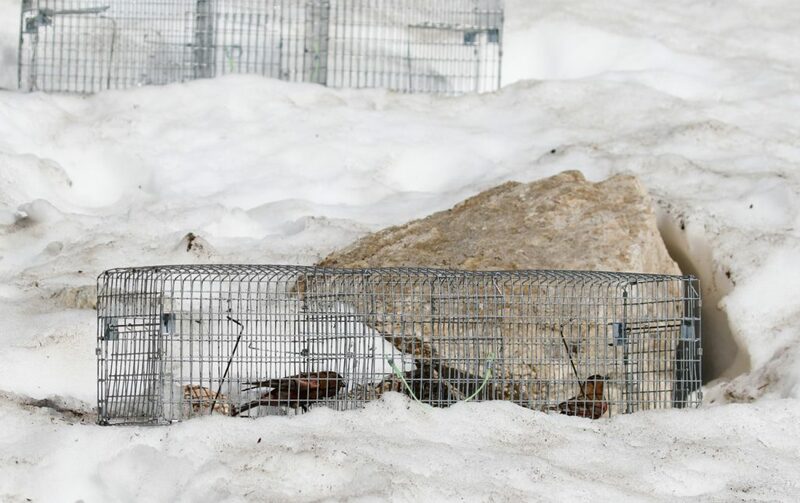 Our team used potter traps to successfully catch and band 13 rosy-finches at Snowy Range. Photo by Joel Such. This summer, we searched for finches in their favorite seasonal habitat: high mountain peaks and alpine tundra. 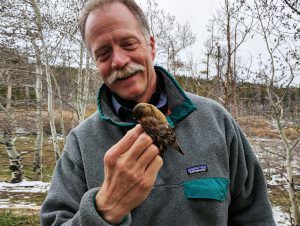 Bird Conservancy’s Science Director, Luke George, and Garth Spellman, Curator of Ornithology at DMNS, visited Snowy Range and successfully managed to capture and band 13 rosy-finches. Each bird was measured, color banded, and a small amount of blood was collected from the wing vein. The blood will be used to examine genetic variation among rosy finches throughout the world and to examine genetic variation among Brown-capped Rosy-Finch populations in Wyoming and Colorado. One factor that will likely impact these birds is climate change. The maps shown above display the predicted distribution of Brown-capped Rosy-Finch under current climate (left) and under future (2050) climate (right) assuming a moderate level of warming (2⚬C) as predicted by climate scientists. The maps show climatic conditions (temperature, precipitation and others factors) that Brown-capped Rosy-Finches require to survive disappearing by the year 2050. The maps are created using confirmed finch records and taking the climate information from those sites to create a predictive model of their distribution. The methods are not perfect. As you can see, the 95 percent confidence current climate model (left) does not predict Brown-capped Rosy-Finches to occur on Pikes Peak, even though we know they occur there. However, the message the models portray is clear. These birds are in peril and unless we learn as much about them as soon as possible, we may not be able to help save this beautiful icon of the the Rocky Mountain state. Luke George and Garth Spellman examine a Brown-capped Rosy-Finch before banding the bird and releasing it back into the wild near Snowy Range. Photo by Joel Such. On our trip to Mount Evans in Rocky Mountain National Park, we managed to capture and band 11 birds. We needed to gather genetic material from at least 10-20 birds in each location—a goal that was met at both Snowy Range and on Mount Evans. Bird Conservancy started color banding birds on their wintering grounds in the winter of 2016/2017 and we hope to greatly ramp up our winter banding program in the 2017/2018 winter period. 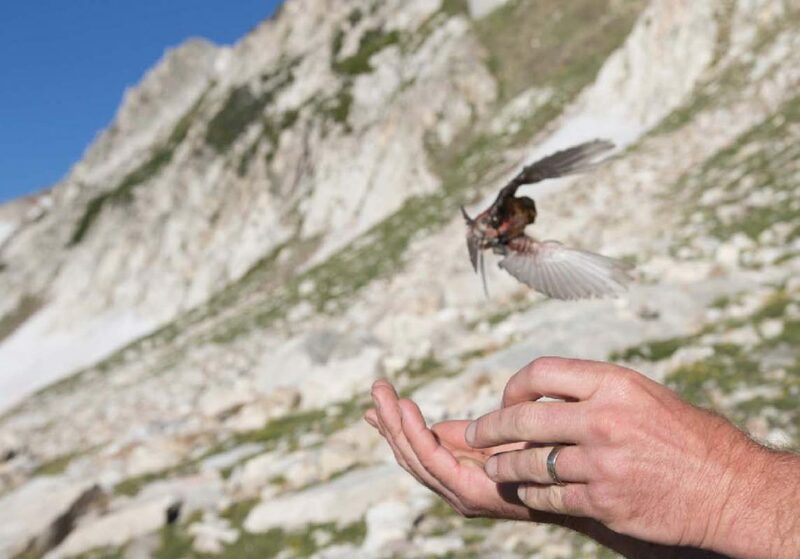 A newly-banded Brown-capped Rosy-Finch is released back into the wild near Snowy Range. Photo by Joel Such. Our work covers the full annual cycle of the finch’s life. Now, with the breeding season over, we will ramp up winter banding and continue to request information regarding sightings of banded birds from the birding community. We are asking hikers, climbers, and birders in the high country of Colorado and Wyoming to keep their eyes out for rosy finches and report sightings. Birds have been banded with a single colorband on one leg and a silver-colored numbered aluminum band on the other. The color bands are red, blue, purple, gold, green and copper. If you see a Brown-capped Rosy Finch, please report the date, time, location (latitude/longitude), the number of birds, and, if the bird is colorbanded, the band color and leg. If possible, include photos of the birds in your report. Sightings can be entered into eBird, on the Rosy Finch page at www.CitSci.org, or using the CitSci app available for iPhones and Android devices.